As the U.S. population has grown, the percentage of unbanked Americans has declined slightly. Between 2009 and 2011, the unbanked rate for the United States increased from 7.6 percent to 8.2 percent. The FDIC estimates that it fell to 7.7 percent in 2013 , a figure comparable to 2009 levels. Meanwhile, the percentage of underbanked Americans increased from 17.9 percent in 2009 to 20.0 percent in 2013, although part of this shift may be due to slight changes in how the FDIC defined “underbanked” over this time period. These findings are particularly relevant to Latinos, African Americans, and young Americans. (see Figure 2) Approximately half of all Latino and African American households are disconnected from the financial system, compared to only about one in five white households. In 2013, 17.9 percent of Latinos were unbanked and 28.5 percent were underbanked, down from 20.1 percent unbanked and 28.6 percent underbanked in 2011. For African Americans, the unbanked rate declined slightly from 21.4 percent in 2011 to 20.5 percent in 2013, and the underbanked rate decreased from 33.9 percent to 33.1 percent. 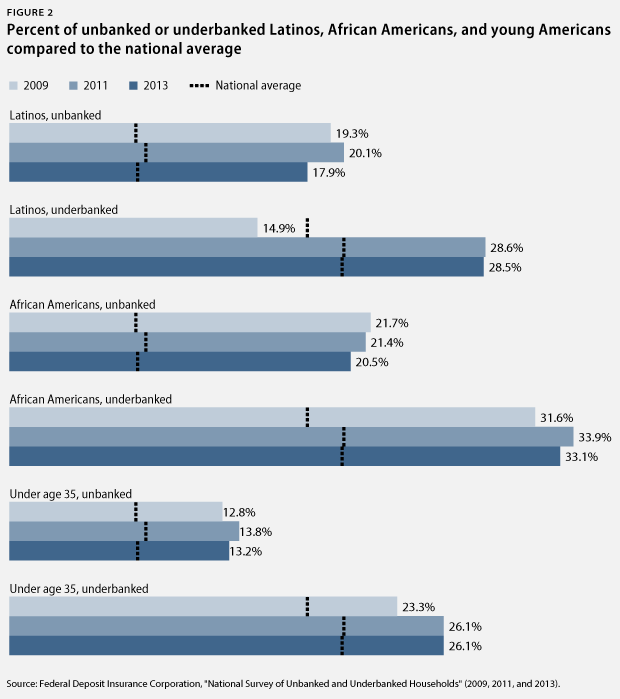 About 4 in 10 Americans under age 35 remain either unbanked or underbanked. Notably, of all of these changes, only the declining unbanked rate of Latinos is statistically significant. Check cashers may charge anywhere from 2 percent to 5 percent or more just to convert a check into cash. Additionally, consumers often have to pay fees again to purchase money orders, load cash onto prepaid cards, or pay bills in person. Even under an optimistic scenario, a minimum-wage worker who is paid $700 every two weeks, pays a 2 percent check cashing fee, and buys two money orders each month would pay more than $30 per month in fees for financial services. Having a safe and affordable bank account or prepaid card instead of relying on cash would effectively give struggling families a raise. Moreover, it would save them time by relieving the need to handle financial transactions in person when visiting check cashers, buying money orders, and paying bills. 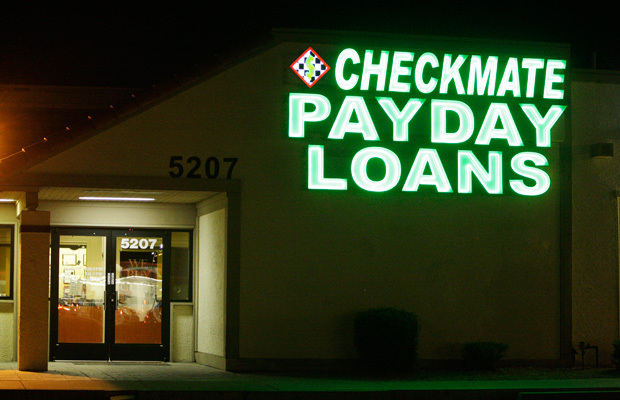 A recent study of Seattle neighborhoods found that areas around payday lenders had higher crime rates than similar communities without these lenders, possibly because large amounts of cash may be present. Conversely, when Missouri gradually replaced paper benefit checks with electronic benefit cards across the state in the late 1990s, crime rates went down as counties transitioned to electronic payments. Having a bank account also makes it possible to get paid by direct deposit and receive funds earlier, which is often more convenient for workers. Without bank accounts, families may not have access to affordable, responsible credit when looking to purchase household items, cars, or homes. And they may not have a safe place to keep savings in case of an emergency. Indeed, in a recent Federal Reserve survey, roughly half of all U.S. households reported that they would be unable to come up with $400 in an emergency without borrowing or selling something. Having access to banking services is a critical first step toward financial security. Joe Valenti is the Director of Asset Building at American Progress.